_ The cast of fictional and non-fictional characters who inhabit my paintings, prints, and sculptures, exist on a plane where nonsense and meaningfulness come together. Within confined environments, these characters narrate a broad spectrum of emotion. Though not necessarily obvious, my work most often reflects what is happening about me. Observation is my inspiration, be it of human relationship, animal behavior, or political climate. I enjoy humor and try to maintain a playfulness in my work whether of light or serious intent. When painting, I often think as would a printmaker, and vice versa. My studio houses materials for both 2 and 3 dimensional projects which have a way of influencing me as I work. The scenarios I create, imagine a range of feeling, from contentedness to anxiety. The viewer can usually fill in the blanks. Please note the following number of statements, either specific to an individual piece or written to accompany a series. Seduction of Chickman, is a parody on fowl courage; Chickman, despite his bad rap as “chicken” does not shy from the fair maiden. Of note: Chickman derives from field work I did for a chicken series produced in KY, I documented the visual and audio behaviors of the birds in their environments, referencing their gender based mannerisms in following works. I have often returned to them in later 2 and 3 dimensional work. 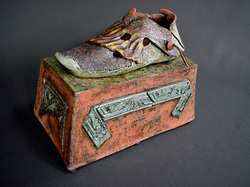 This ceramic work, "Homage to a Shoe" was created for a theme exhibition entitled 'Alexander the Great'. I chose to reverence a single personal possession of the warrior-king, his shoe, by placing it on a pedestal. Research and imagination determined a shoe handmade for Alexander in his time would have been of soft leather, perhaps goatskin, and would likely enclose his foot to protect it from flying rocks and debris encountered on his extensive and distant conquering activities. It's inner sole would be lined with hide to wick away moisture as well as insulate against the vagaries of climate. 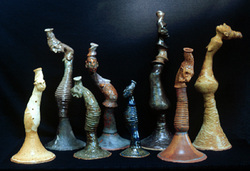 These ceramic pieces are from my Soulhorn series, consisting of many sinuous figures which sound a tone or two when played. The horns embody the solitary spirit of the prairie, a metaphor for the lonely howl of the wind across the unimpeded plain. They were built of stoneware or terracotta clay and sound a deep rich tone when accessed by elementary trumpet or bugle skills. Pray for rain, could just as well be entitled Pray for no rain. It reflects the ever awareness of North Dakotans and other rural state dwellers to the nuances of their weather. Metaphorically, Pray for rain, could refer to any one of many human endeavors, the success or failure of which will be determined by forces beyond their control. It is to those forces we appeal, as have all cultures before us going back to the beginning of time. 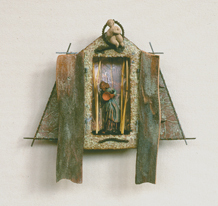 This is one of five small assemblages composed within a shrine format. Each is constructed of ceramic and wood with cast paper or printed side extensions. The intimate format and small scale of these pieces challenged me to limit my natural tendency toward complexity and vibrant color; allowing less to become more. This series, entitled Table-ladies, features a woman whose image evolved from other works involving a table. The Rockwellian idea of table, as an important piece of furniture upon which nourishment is taken, games played, lessons taught and socialization enjoyed, I've fashioned in unity with the woman. In her traditional role as caregiver, the table had been her altar. In this series, the table-lady is self-encumbered as she struggles to perform wearing her historic ‘table attire.’ While society demanded expansion of her role, it didn’t allow her to remove the trappings of her former obligations…therefore she metaphorically dons the garb of her forebears, competing in her table-wear. The image of the child in my work developed during the years when I was in close daily contact with young children, both at home and in the elementary school setting. These pieces recognize the vulnerable nature of the child who is unable to decipher clues which inform of risk and jeopardy, as well as pleasure and merriment. The mix/match of emotion to situation is the idea that I explore in these particular works. I call this series the Scared Babies. A dark and stormy night, a relief print, is also part of the series, Scared Babies. The imagery comic in form, is of a child situated in a rather ominous and frightening place. Unable to discern real situations from imaginary, nor distinguish dangerous from benevolent, s(he) is vulnerable to the seduction of whatever presents itself. The imagery in this series metaphorically refers to an environment in which many of today’s children are placed. Their world is not always safely protected by parents, community, state nor national agencies; the well-being of our youth has fallen in position on this culture’s priority list. Not unlike many of today’s children, the kids depicted in this series are in various states of recognizing their own vulnerability. Gathering finds, rustic and worn. Is tangible evidence in another form. Still cling to what has been before. that which touches both far and near. I’ve used many plates to overlay multiple colors, patterns and auxiliary elements. The 'ropewalker' proceeds along her path, each movement and gesture carefully measured to insure continuation of the journey embarked upon. The balance on the rope is heightened by the attention she gives to what she brings with her; these are the elements that make up her life. At times she appears relaxed and agile on her high wire walk but as often her footage is shaky and her holdings disturbed. This painting is one in a series of large figurative works in which the figures either assume the anxiety of a situation in which they find themselves or are in the process of transcending. I have often used airborne figures and objects in these works to signify chaos or lack of control, but in Ascension Party, the birds and the figure on the swing are clearly in a state of release or ascent. The conductor holding the score, the musicians and the man on the ladder all contribute to this moment of transcendence. This whimsical couple is based on a painting of mine entitled, The Boyfriend. The ceramic sculpture deviates from the painting with the beau being cast as a clothed chicken. Chicken imagery has long been near and dear to me. I chose this subject to explore in the ‘80s; the antics of the birds I studied in their coops and warehouse congregations, provided me with an apt metaphor for gender relationships. In the right upper corner of the painting, the spirally arranged words read: “Can we go on like that?---Yes, in a circle. What can we do? ---Not anything. How express our rage?.....’’ these words by Gunter Grass from his poem, Do Something, express the concerned sentiment of this work, which I created following the start of the Gulf War. The circle of children on the left will be affected by the men on the right, but will those ‘in charge’ have the capacity to see, hear and speak for the welfare of all? At center of this image is a house, the container of a soul, held in tow by the holder who guards it. Surrounding her are those whose presence reflect her life and her memory; they connect her to a larger reality. I find perusing past and personal images and statements akin to rereading one's own diary, a week to week encounter of thoughts, beliefs or disbeliefs throughout a lot of years. Interesting to me is which images seem as comfortable or relevant to me now as they did when they were created. Those might reveal a more persistent or overall internal condition of myself.